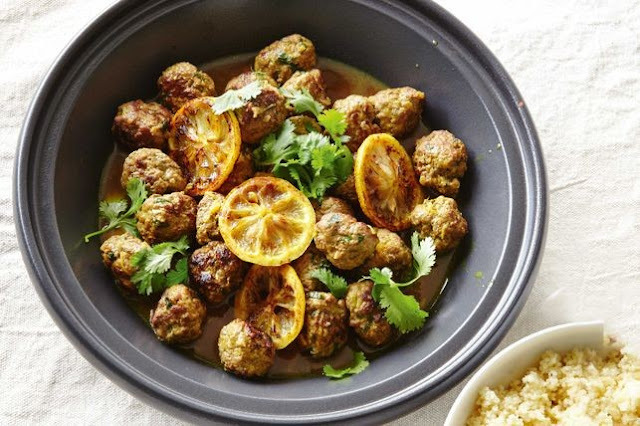 The ground cinnamon pairs perfectly with the lamb in the kofta, adding a warm and spicy favour. Step 1 Combine the lamb, onion, cinnamon, cumin and one-quarter of the coriander in a bowl. Season well. Mix with hands until well combined. Roll tablespoonfuls of mixture into balls. Set aside. Step 2 Cook the meatballs in 2 batches, turning often, in a large non-stick frying pan over medium-high heat for 8 minutes or until cooked through. Transfer to a plate. Step 3 Wipe the pan clean. Heat the butter and oil in the pan over medium-high heat until butter is foaming. Add the ginger, garlic and turmeric. Cook, stirring, for 1 minute or until aromatic. Add the stock and simmer for 8 minutes or until reduced. Add meatballs and lemon juice and stir until heated through. Stir through remaining coriander and top with pan-fried lemon slices. Serve with the couscous. To pan-fry lemon slices, spray a frying pan with olive oil and cook slices for 1 minute on each side or until caramelised.